No more business as usual. Retail is changing every moment due to new technologies and if you fail to adapt, you might get a hard time. There are loads of new developments every day it seems, and a good part of them concern online shopping. But what we all know as well, is that improved in-store experiences are more and more a topic too. Customers have plenty of choices when it comes to where they spend their time and money. So, in order to stay competitive, you need to give them compelling reasons to come down to your store and shop. To maintain the foot traffic, luxury retailers are using mixed reality, such as virtual reality (VR) and augmented reality (AR) technology to engage customers with enhanced experiences in-store. 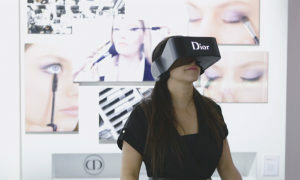 In London, Tissot allows shoppers to try on their luxury watches virtually at Selfridges and Harrods’ windows. Christian Dior developed VR glasses called ‘Dior Eyes’ that give visitors a sneak peek behind the scenes at their ready-to-wear fashion shows. Zara launched their self-service checkouts, allowing customers to skip the queue and buy their items via do-it-yourself kiosks a la Tesco. You can just hold up an item in front of it, and it will be added to your basket. No need to search for tags and scan barcodes. In New York City, the flagship Rebecca Minkoff store features a smart video wall that suggests new styles when people pass by or enter. Customers can even use it to order champagne to sip while they browse the collection! In the fitting rooms, interactive mirrors let consumers set the light mode, to see what the outfit they are trying on would look like on a sunny day or in a club. With just a few clicks, shoppers can also order a different size or colour, or find an item that complements their purchases, straight on the fitting room mirror. The result? Sales have been up more than 200 percent each year since installation. Are you thinking about implementing some of the above, or do you have a completely new idea? Imagebuilders is partnering with a company specialized in creating software for these kind of technologies and we would love to help you improve your in-store experiences with more than just furniture.